Bean Pong, Spring 2017 « Comics! Games! Anthropology! 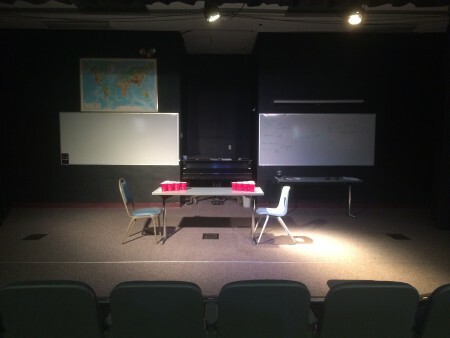 A while ago I dreamed up playing a version of beer pong as a final review activity. With each semester that has passed, I have adapted the game to various class sizes. This semester was my second with a class of over 50 students and I have arrived at a set of rules that made such a large number of participants work. The first time with a large class did not end up well for one big reason: one was that there were too many teams (12-13) for a 70 minute tournament. This semester, I simply combined the teams, so two random teams played another two random teams in each game. To pseudo-randomize the team pairings, I pre-wrote each team name on a notecard and drew from that stack before each game. There were also some rules that slowed the game down. At first, a question was only asked if a student made the ball in a cup. For a matchup of two less-agile teams, the there were sometimes over ten tosses before someone made it. On-the-fly with suggestions from the boredoming crowd, I changed the rules mid-game so that if a student missed, then that student had to read the other team a question. This kept the pace of questions the same as ball tosses. Another rule that made the game slow was that I had students play to five. Playing to three instead gives students a chance to participate and keeps the tournament moving. Arrange Solo-brand red cups in two triangles of ten cups on both ends of a long table. Desks or chairs can be added to extend the tossing distance. The triangles are arranged like arrows pointing towards each other (medially). Add beans to around a quarter full of each to act as weights. Two pounds of beans is a good minimum amount. Place a quiz question in each cup. Or, for faster setup, divide questions in half and place them in piles at each end. Have student form in around 8 teams. Teams of not-divisible-by-four numbers can give losing teams a chance to play to keep them in the tournament. Have each team come up with a name and write it on a notecard. Shuffle and draw from the notecards to determine who plays first. Decide which team throws first. This could be done with a coin toss, rock-paper-scissors, or a warmup question. The tossing team tosses 1 ping pong ball towards the other end of the table with the goal of landing it inside a cup. If the ball misses, the tossing team asks the cup team a question from their pile. If the ball hits, the cup team reads the question from their pile to the tossing team. If the tossing team cannot answer, or answers incorrectly, the turn goes to the other team. If the tossing team answers the question correctly, they score a point. The turn goes to the other team to toss (to discourage shutouts). Teams play to three points. One last change was that I decided on “Bean Pong” as a catchier name than “Beer(less) Pong.” It’s shorter. My original post advised that class sizes of over thirty were not playable. With some actual game hosting experience and suggestions from various people, I think I have settled on a good setup that works for around fifty students. Oh, I mentioned in another post how I teach in the Small Theater of MiraCosta College. The stage setup was amazing for this game. I had the cups set up on a table behind the projector screen. I had a student work the stage lights from the control room as I raised the screen and played “Get Ready for This” by 2 Unlimited.